I confess being more than a little disturbed by this statement from an ‘Army Spokesman’ – how about a General at the Pentagon or the Joint Chiefs confirming that this whole kerfluffle was a deliberate attempt by a maverick soldier, and that this soldier has been disciplined. Nothing? Anyone? The slide was not produced by the Army and it does not reflect our policy or doctrine. It was produced by a soldier conducting a briefing which included info acquired from an internet search. Info was not pulled from official Army sources, nor was it approved by senior Army leaders, senior equal opportunity counselors or judge-advocate personnel. The Soldier, after being challenged on the information, recognized that the information was incorrect. The briefing has been updated and any reference to American Family Association has been removed. 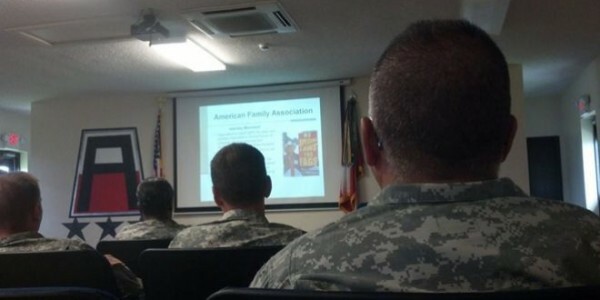 Soldiers who attended the briefing will be notified that the information regarding AFA was incorrect. I am unaware at this time about the intervention of an Army Chaplain. Do you consider the matter closed?